Cults are on my mind lately. For one thing, I’ve developed an addiction to the new Netflix series Unbreakable Kimmy Schmidt. It’s a Tina Fey/Robert Carlock comedy about an Indiana woman who escapes a doomsday cult and remakes her life in New York City. Much wackiness ensues. But also, and more seriously, one of my college friends recently shared a reflection on Facebook. Theresa related how she was “raised with antiquated theology in a pre-Vatican II cult,” and the term “cult” was no exaggeration. I thought her analysis of that experience, and what it means to her today, was remarkable. Therefore, I am doing something unusual. I am hosting a guest post, and the guest post is Theresa’s reflection. I share it below, and use Theresa’s real name, with her express permission. I am not sure what brought this thought or memory to my mind, but I thought it deserved further reflection. Furthermore, I am not sure why I am sharing this with others. Maybe I am seeking feedback, or maybe I am just sharing my bizarre childhood, but here it goes. You know in The Sound of Music, when Marie says, “Sister Benedicta has me kiss the ground every time we have a disagreement…Lately, I have come to kissing the ground whenever I see her coming just to save on time”? I vaguely remember kissing the ground as penance, as an act of humility to help release and save souls from purgatory. The concept of indulgences was very much alive in my childhood. How old am I, you might ask? I am only 34, so I was raised with antiquated theology in a pre-Vatican II cult. 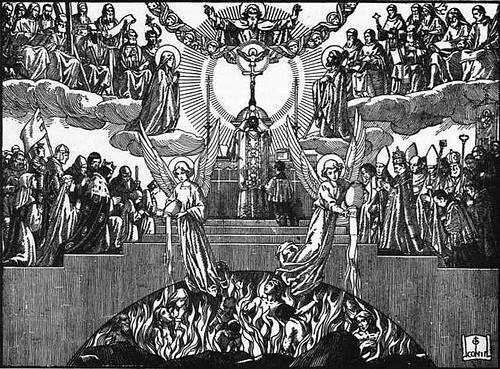 I prayed the rosary, the Stations of the Cross, the trisagion, and various other sorts of invocations with the intention of saving my soul and the souls in purgatory. I literally would say a rosary of St. Gertrude prayers a day. As a little girl from three to eleven years old, I just loved Jesus and I wanted to love and serve him with all of my heart. From ages twelve to seventeen, the only way I knew how to love God was to be nun-like, and pray three to eight hours a day praising God, and get to know God through Scripture and the writings of the saints. I might have been legalistic, and I bought into indulgences and saving souls from purgatory. But it was genuinely out of love for God and love for those people. I wanted all souls in heaven with God, so I would devote hours to helping souls get to heaven. Looking back, I wonder: was there a benefit? Even if it was bad theology, did it please God in some way? Did those hours of prayer count for something? Did it impart love in the world in some way unknown to me? Or was it a waste of a childhood? In many ways I don’t regret this period of time. How could I? These were my formative years. I think those years of prayer, love and desire kept me focused on God and not the cult. Although the cult informed my theology, it was God I cared about, and it was all done for him, not the cult. In fact, the cult only required a rosary to be said on Sundays. I can honestly say: I think God saw me, saw my love, and had compassion on me. I think God withdrew me from the normal world and normal social structures to make me God’s own. It was just God and my Gay self. I didn’t have the influence of status symbols, or keeping up with the popular kids. I could never be popular as an obedient, nice, weird religious kid who had to wear skirts and long sleeves all the time. This isolation, although it impacted my worldly social skills and development, made my life about me and God. And there is freedom in that. It meant I had a clear sense of who I was, even though I came out of a strict, heteronormative, traditional cult. Knowing that God loved me, and knowing that I was Gay and that you couldn’t pray the Gay away, confirmed me in myself and God alone. I didn’t care what anyone else thought, not even my cult, because I knew my heart was with God. While I was praying for all “the sinners,” while I was loving God, and while I was loving my neighbor by praying for them to be in heaven as God desires all in heaven, God engulfed me in love. I knew God loved me no matter what. And I knew I was Gay and God still loved me. In fact, being Gay allowed me to show love, compassion and forgiveness toward others in a way I know I wouldn’t have arrived at if I was straight. While the church still has purgatory, indulgences and penance in the Catholic catechism, I am sure that my childhood understanding was quite medieval. My saying of fifty St. Gertrude prayers in my head meant I implored God to release at least 150 souls. Yet it was still done out of love for them, and not duty. I am sure that God smiled on it and used it in some way unknown to me. But for some reason I was just wondering and amazed at how God loves us through our bad theology. We think we have it right, but thank God that God sees the intentions of our heart. P.S. The picture I chose was an image from my childhood. Thank you, Theresa, for your willingness to share this piece. This entry was posted in LGBTQ, Spirituality and tagged Catholic, Catholic Church, Catholic imagination, Christianity, God, lgbtq, love, prayer, theology by Justin Sengstock. Bookmark the permalink.